Good day boys and girls! The holiday season is here, and Christmas is not far. Most of your neighborhood shops and malls will soon be decked up with lights and decorations. You must be excited about all the fun and laughter you will be having with your family and friends. 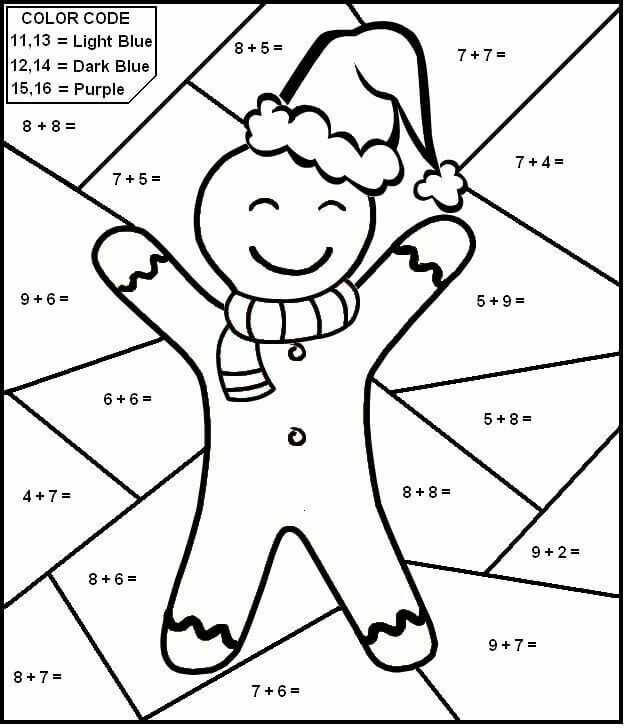 To make your holiday even more wonderful we have brought for you an exciting collection of Christmas color by number activity sheets to print. You can enjoy doing this activity on your own or turn it into a game by playing it with your friends or family. Let’s find your guardian angel for this Christmas with our first activity in this collection. Can you see the smile on her face? 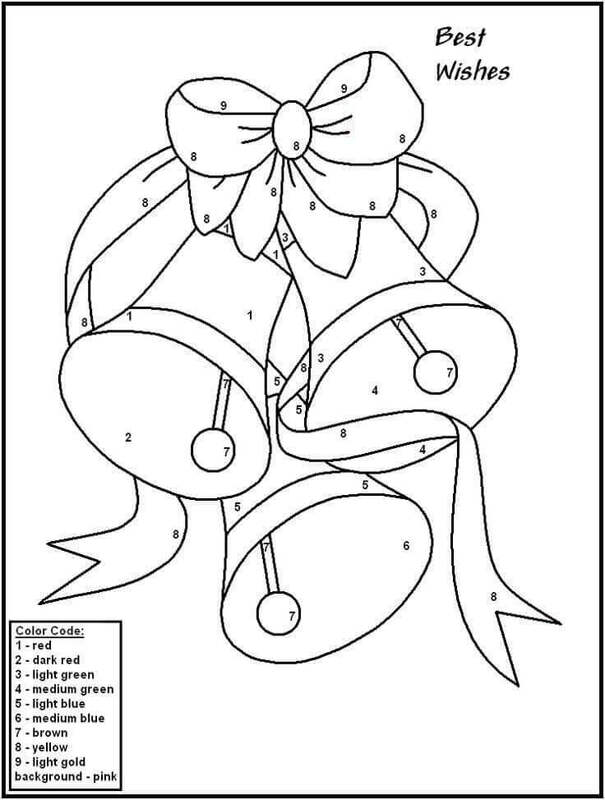 Check the instruction regarding the colors given on this coloring page and you will discover your Christmas angel in all her brilliant glory. These Christmas bells look appealing, tied together with a neat bow, don’t they? You will be having something similar when you start decorating your Christmas tree. 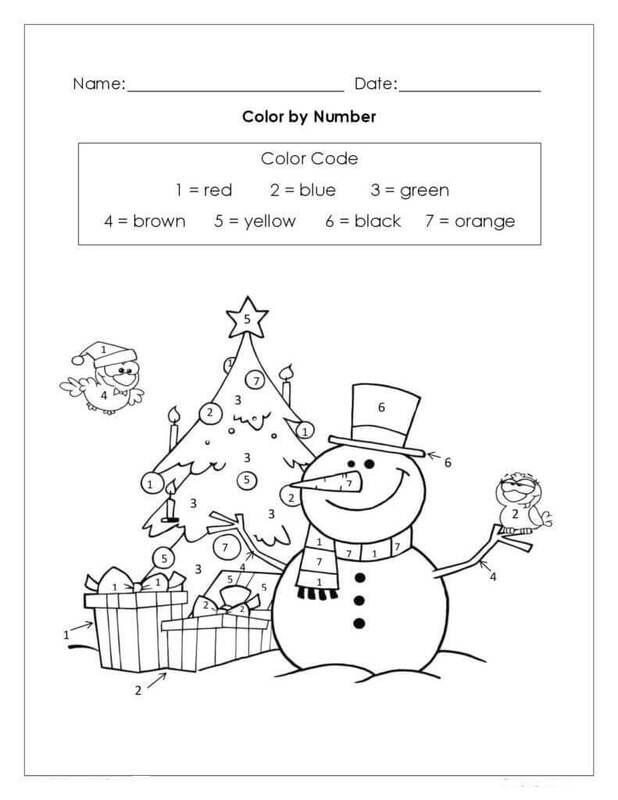 You can print this page and follow the coloring numbers to bring out the wonder of the jingle bells. You know it’s the festive season when every house you pass by on your way home and the shops and the malls are fully lit with decorative Christmas lights. There are varied designs and colors of lights available these days. In the olden times, people used to light candles to decorate their Christmas trees and to illuminate the house. 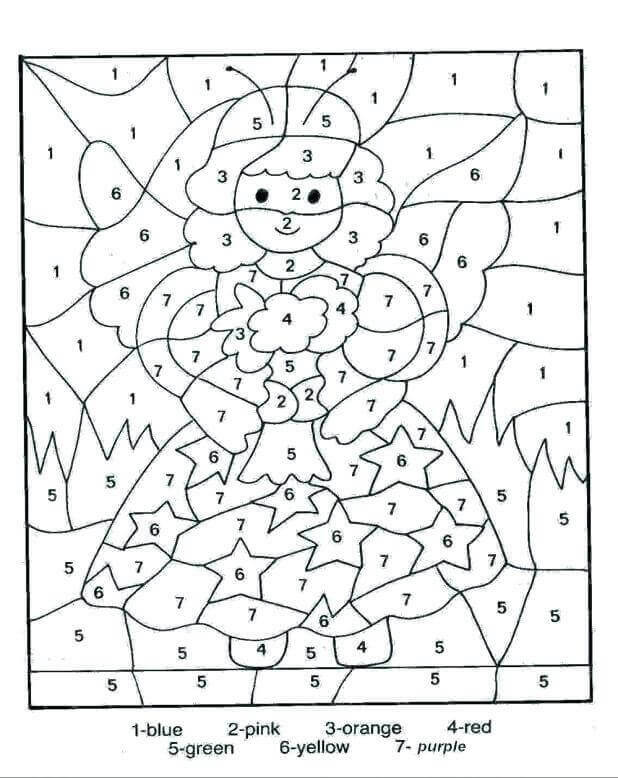 If you print this page and color according to the numbers, you will find two candles especially lit for you. If you are asked the best thing about Christmas, we are sure you would say it’s the presents. After all, we are excitedly waiting for Santa Claus to bring us our gifts. Like Santa, we too must do our part and share in the festivities with the less fortunate as well. Look at this little girl and her pet, bringing a gift to a family in need. 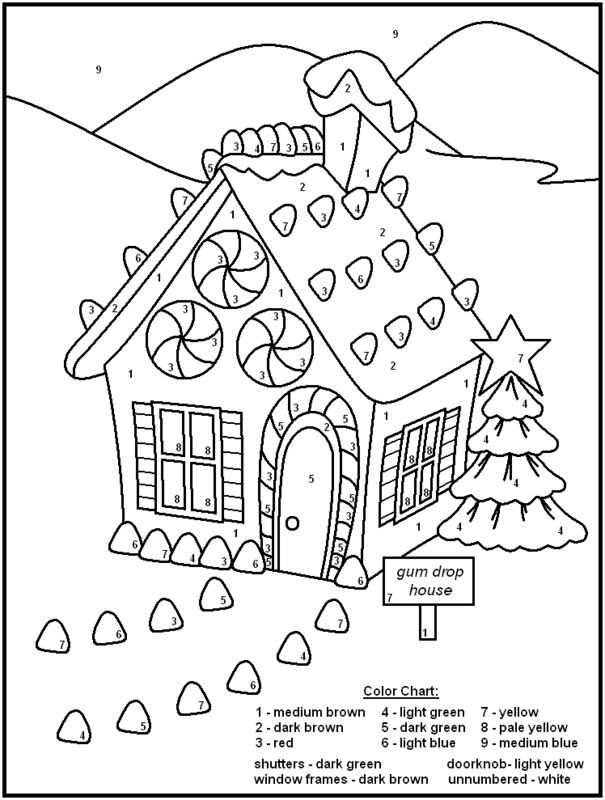 Appreciate their holiday spirit by printing and coloring this heart-warming Christmas scene. You must have come across wreaths on your own door or your friends’ house during Christmas. They feel like a welcoming sign, inviting positivity and goodness. 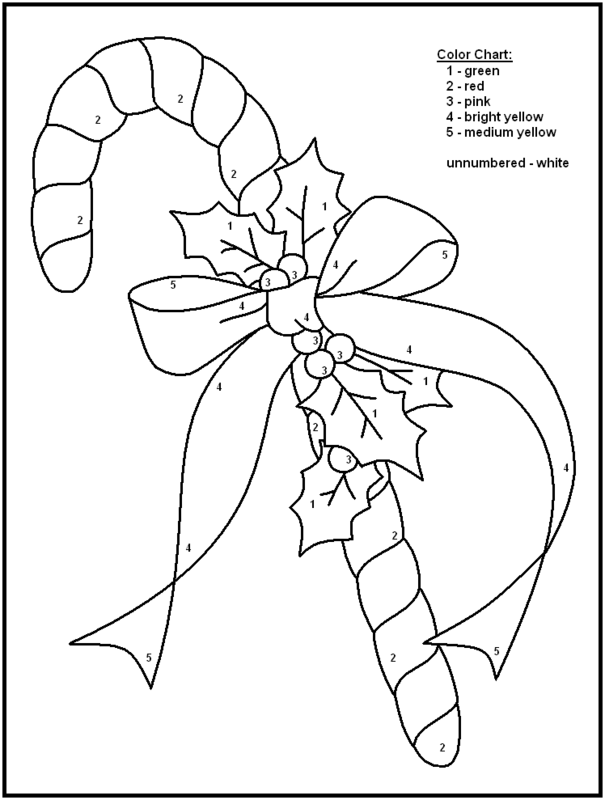 This Christmas special wreath looks a little plain and needs your help in blossoming to its colorful glory. You just need to print this page and color each segment by its corresponding color. Christmas lights have come to be used to now, to complete the Christmas tree decorations. They are also used to light up the house. Pretty soon you will be seeing these lights sparkling on every house in your neighborhood. Print this page and give these lights different glittering colors. There’s a twist! 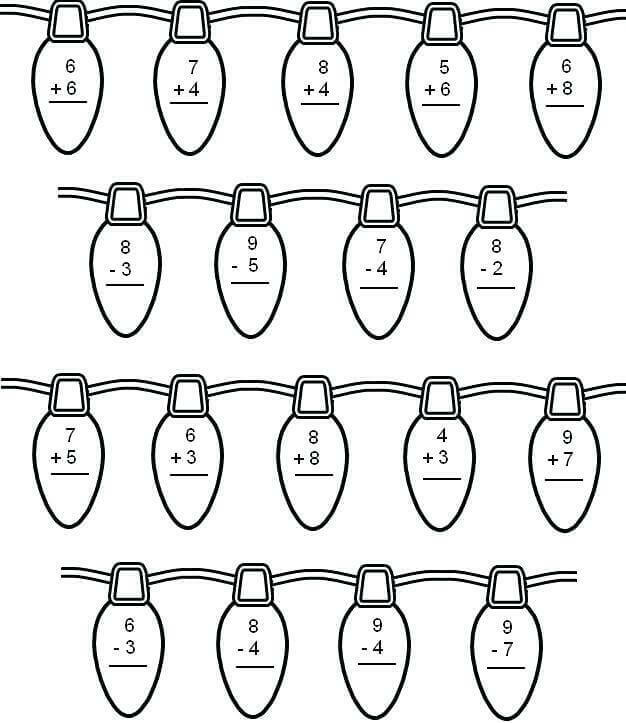 You will have to solve the mathematical problems – addition or subtraction – on each of the light bulb. Give the same colors to the bulbs having the same answers. Once your family is done with Christmas tree shopping, it’s time to get decorating. Just like these fellows, who are already halfway through their work selecting pieces from their box of Christmas ornaments. You can help them by adding colors to the illustration once you are done working on the solutions to the addition problems. When you can get the answers right in school, you feel happy, don’t you? As happy as this gingerbread man is when it’s the holiday season. He looks all prepared for winter with his special Christmas hat and scarf. Let his happiness last longer by quickly solving the addition problems in each segment and color them accordingly. From snowflakes to stars, from an angel to a Christmas tree, this illustration is full of things that represent Christmas time. Right now, it is hard to distinguish them from each other. 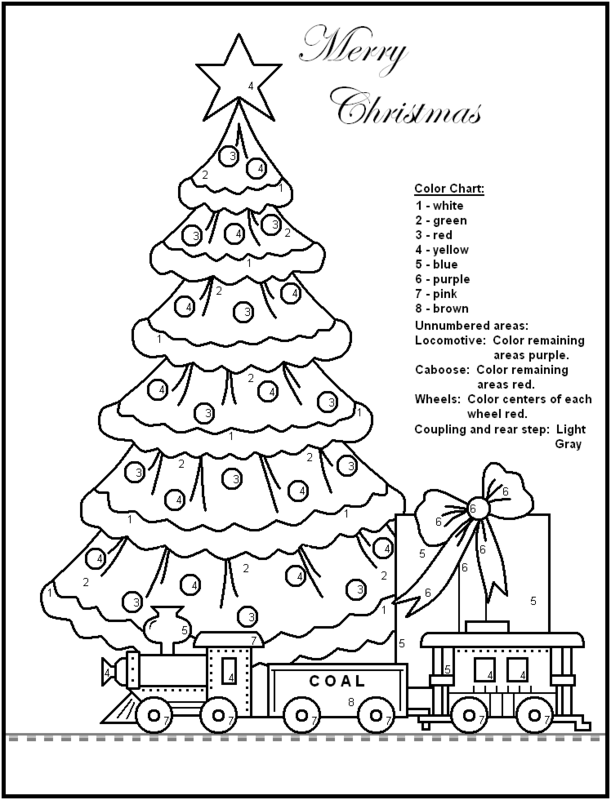 Pick out the six colors you will need from your collection and start coloring the illustration by numbers to discover the colorful world of Christmas on this page. Besides the gifts, decorations and all the festivities, what makes the holiday season special is also the wonderful food you get to eat. Look at these candies here on this illustration. Something is missing though. They all look so plain. 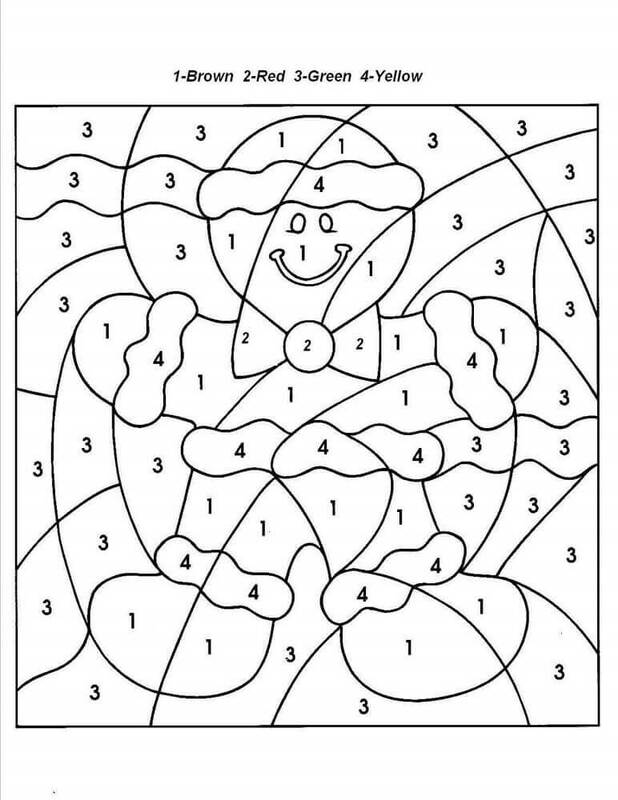 Print this page and color them according to the instruction. 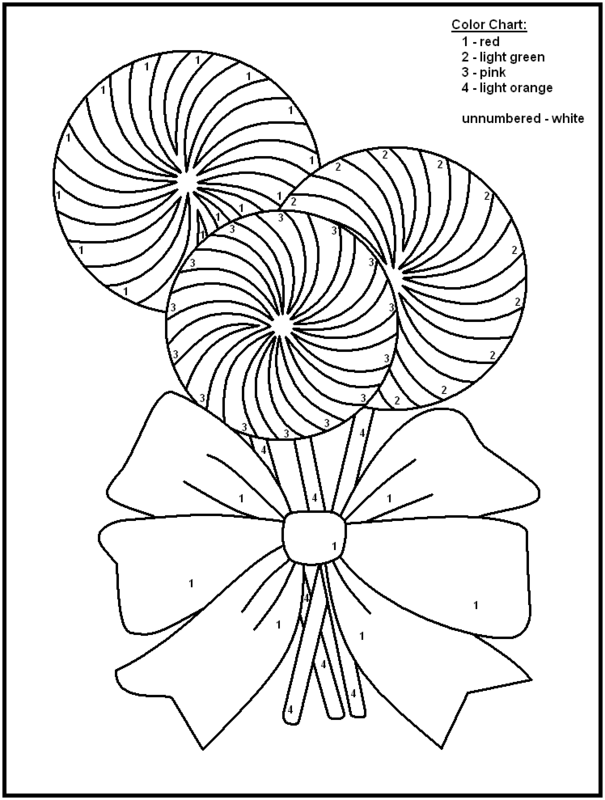 You can treat yourself with some candies once you finish coloring. Every household stock up their candies, some even carefully wrapped them, during Christmas time when many relatives, especially the young ones visit. You will surely be glad to receive a candy gift like this one. 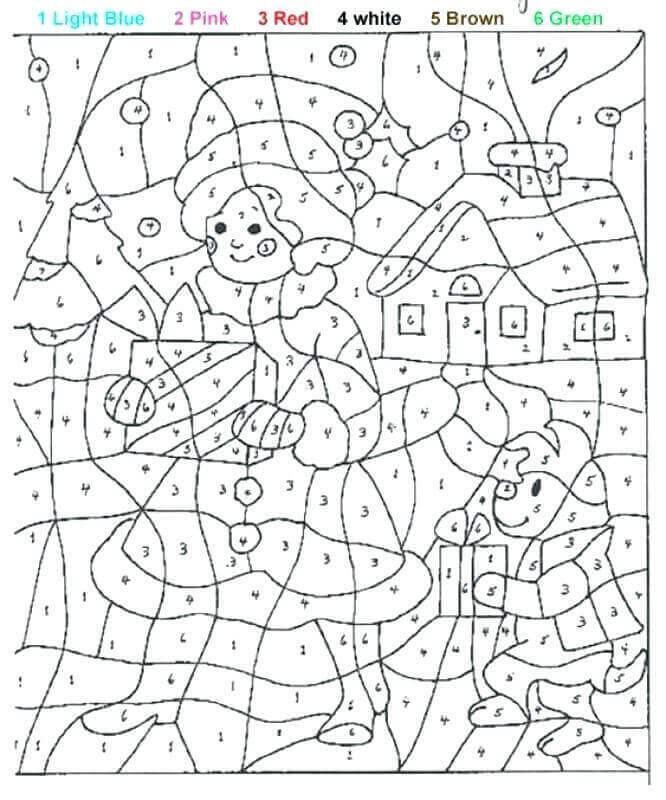 Anticipate all the fun treats you will get to eat during Christmas by printing and coloring this page. Christmas has come early for this snowman. He has already bought and decorated his Christmas tree as well as wrapped up all the presents. No wonder he is smiling wide with joy. Even the birds have joined him in his happiness. Bring out the color in his joy by carefully coloring each number with its corresponding color. Every festive occasion has its own gastronomical delights. Whether it’s turkey for Thanksgiving Day or pumpkin pie for Halloween. But candies are a treat, all year round, especially during the holiday season. Don’t you agree? 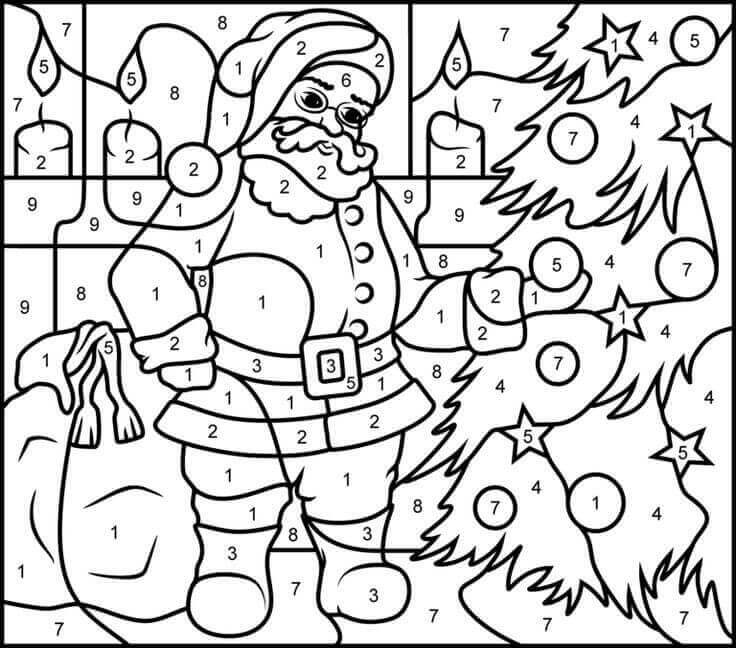 Bring out this special treat on this page by coloring this illustration by number. 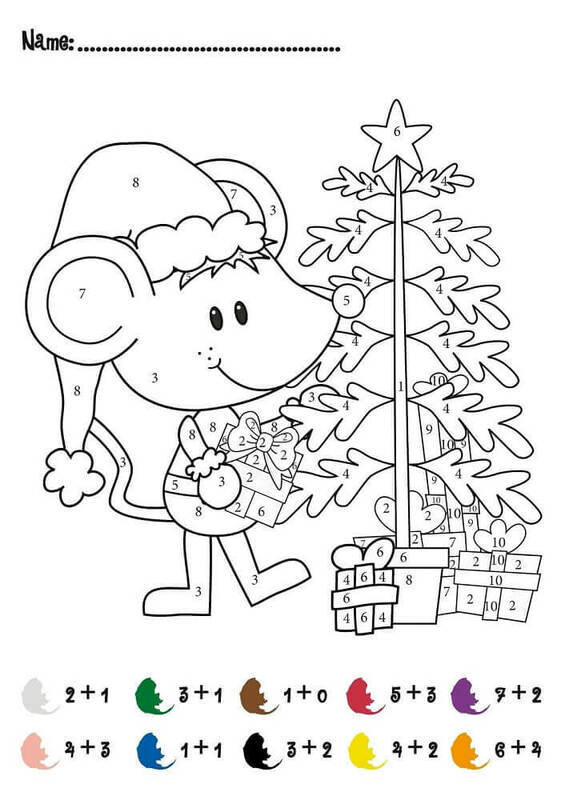 Before you start coloring to help with this cute little mouse’s Christmas preparations, you will have to work on some math. Figure out the correct numbers corresponding to each color by solving the addition problems. 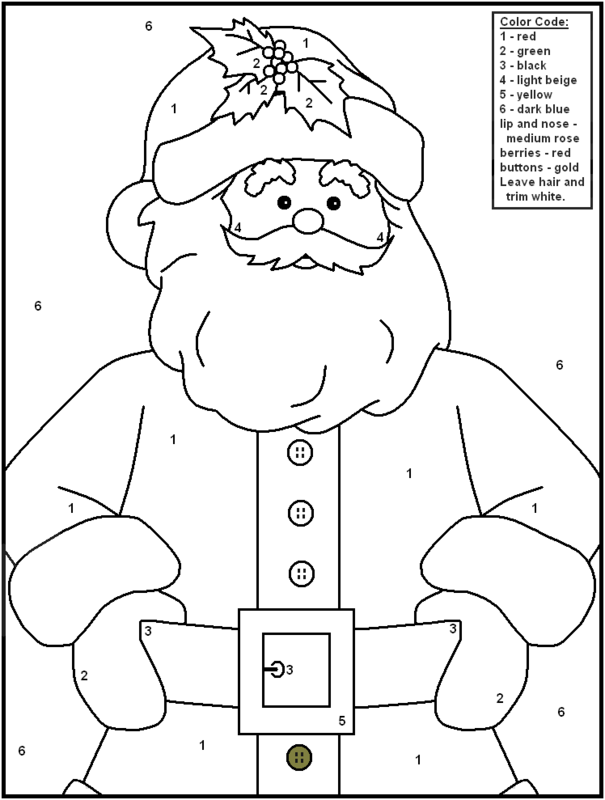 Once done, jump right in and start coloring this Christmas scene. You know it is Christmas if you see a candy cane and Christmas berries. Look how elegantly they are both tied together in a bow by the ribbon. 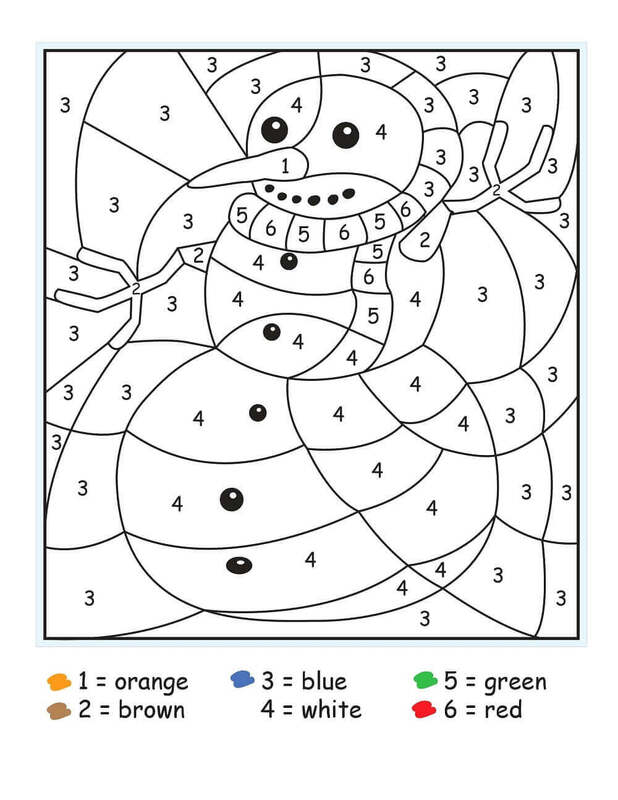 Let these Christmas symbols reveal their true colors by printing and coloring according to the instructions. Is your mouth watering just looking at this multi-tiered Christmas cake? Imagine how it will be once you finish coloring it. All you need to do is follow the chart and color each numbered segment according to their corresponding colors. You might even end up wanting to eat it off the page after you are done! Santa brings you all the gifts, but he does it with some help from his loyal friends. Yes, you are right. It’s the Christmas elves. They work tirelessly sorting out and packing all the gifts, looking after the reindeer and one or two of them even accompany him sometimes for deliveries. 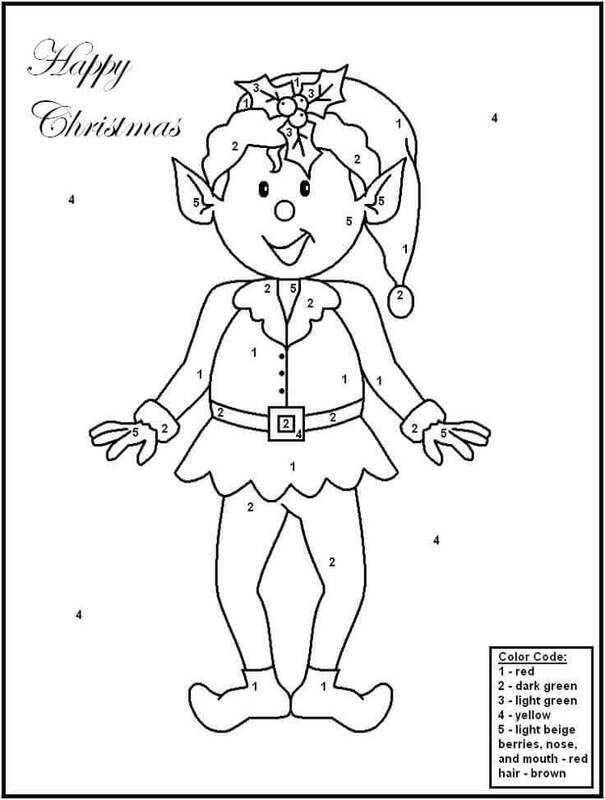 If you are not sure about how they look like, color according to the instructions on the page to meet this joyous little elf. Your Christmas trees will look dull and lifeless without these wonderful Christmas ornaments perched, tied and hung on them. 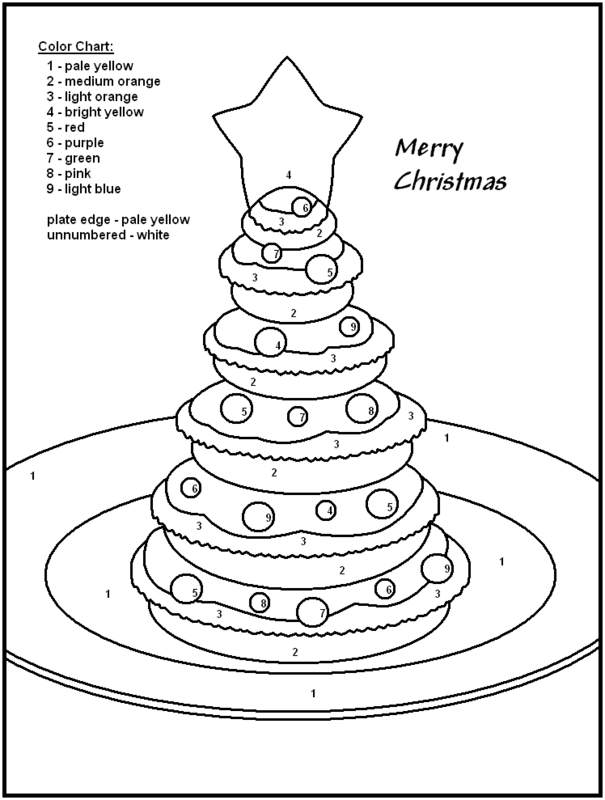 This coloring page showcases a close-up of a well-adorned Christmas tree. 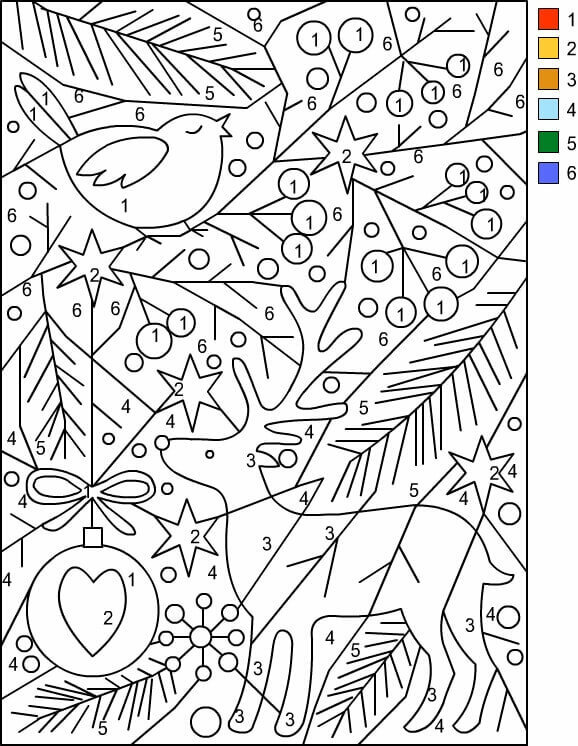 Get ready with the nine colors you will need to start coloring this sparkling scene. Christmas trees that are bought for your homes can either be artificial or a real one. The natural Christmas trees are species belonging to the evergreen conifers. You can find three of these trees growing on the hills in this illustration. Someone has decorated these trees as well and left a gift too. 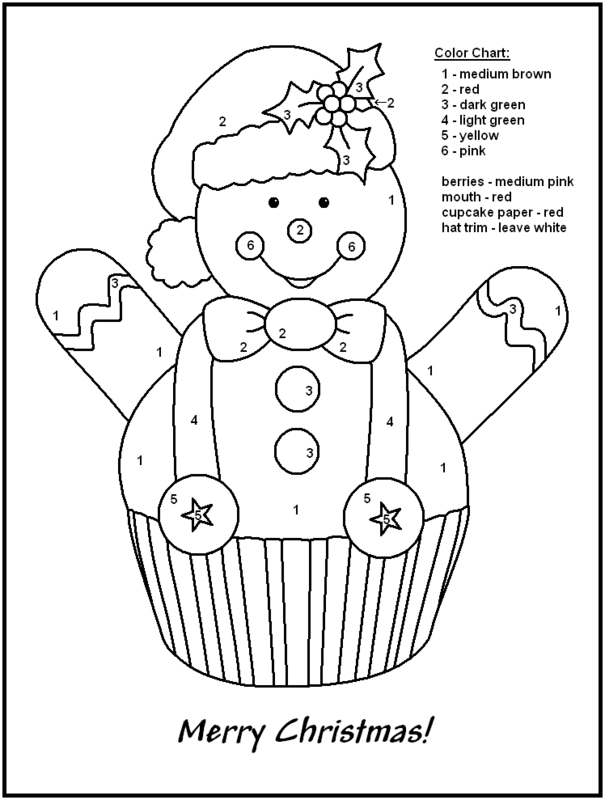 Let their natural colors shine by printing and coloring the page according to instructions. This elaborate illustration will remind you of the Christmas plays in your school. Some of you might have also taken part in one. 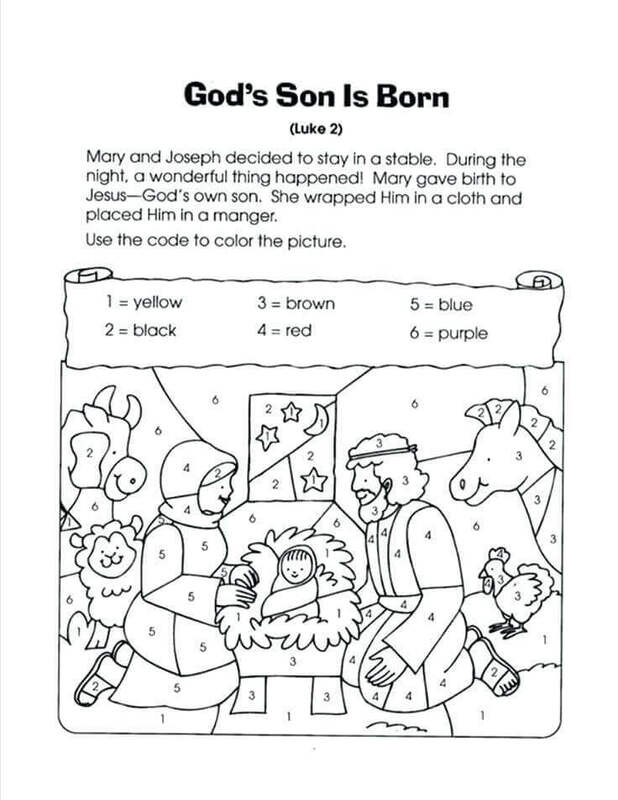 This shows the night when Jesus was born in a stable, to his parents Mary and Joseph. If you follow the color code correctly, this miraculous event will reveal itself in great colors. One of the many traditions of the holiday season is making the gingerbread house, which is made by baking, cutting and constructing the gingerbread cookies. This gingerbread house even has its own name, “Gum Drop House”. Must be because of the gumdrops used for decorating the house. 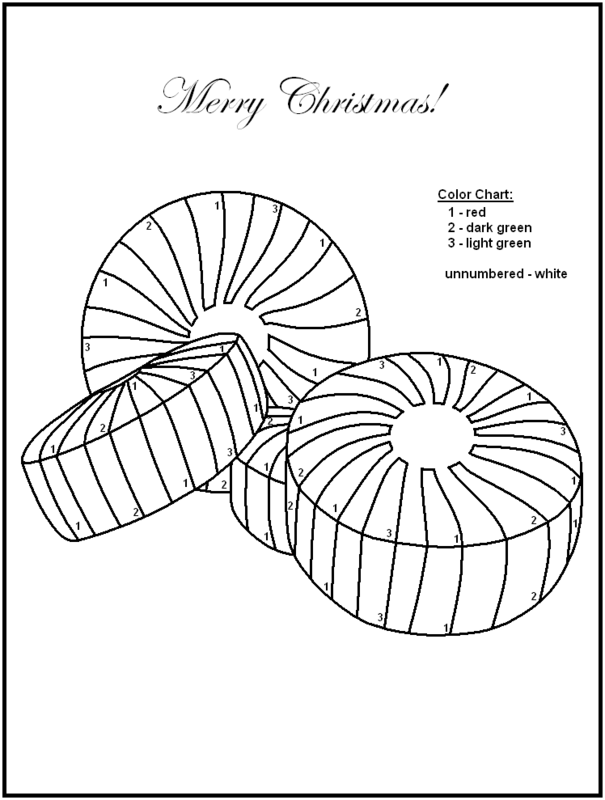 Find out how it looks in color by following the instructions. It’s no wonder that, if there are gingerbread houses then there will be gingerbread people too. 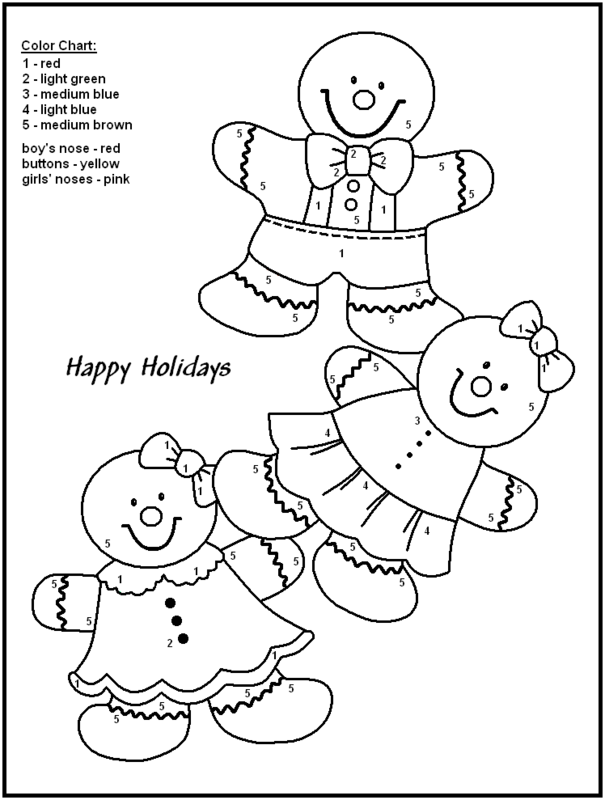 You can find three of them ready for the festivities, dressed in their glamorous attire, on this coloring page. Make their happiness three-fold by giving them colorful costumes and smiles. There is a new kind of Christmas tree in town. Unlike the usual trees that come with branches, this special one comes with problems. 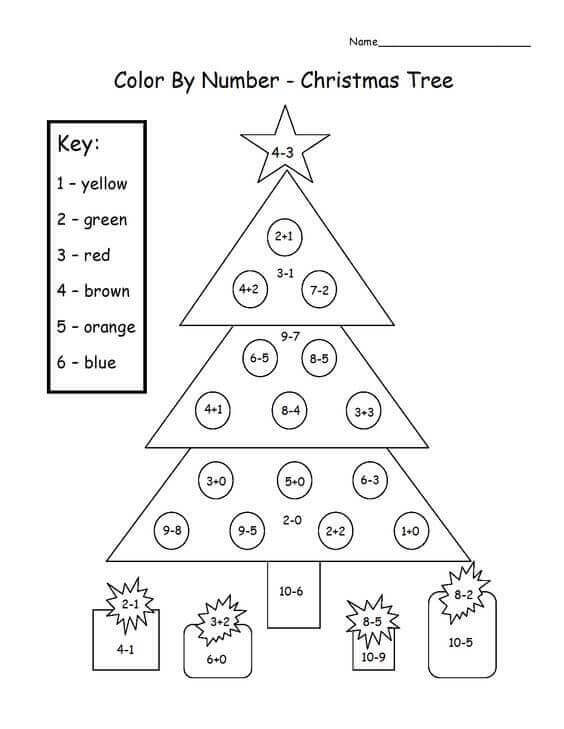 It’s the Mathematical Christmas Tree! 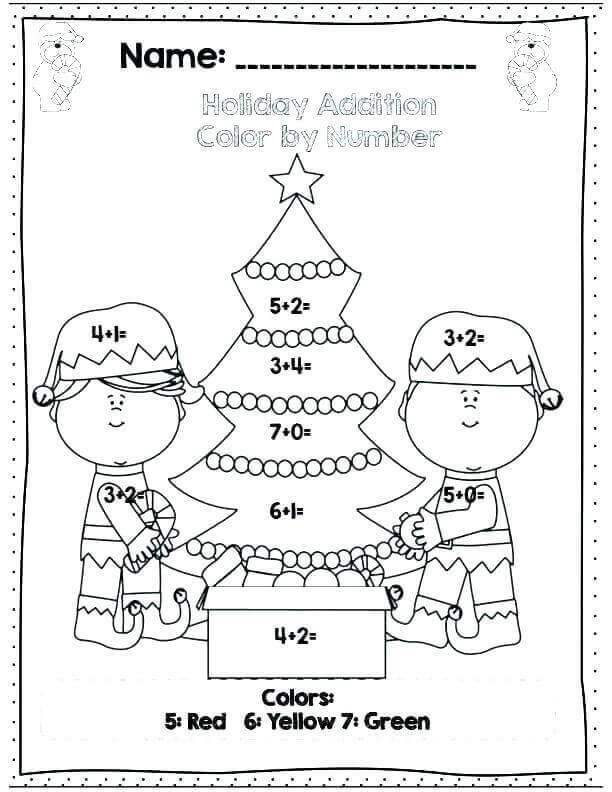 A Christmas tree you can decorate in full colors, only if you can solve all the addition and subtraction problems. 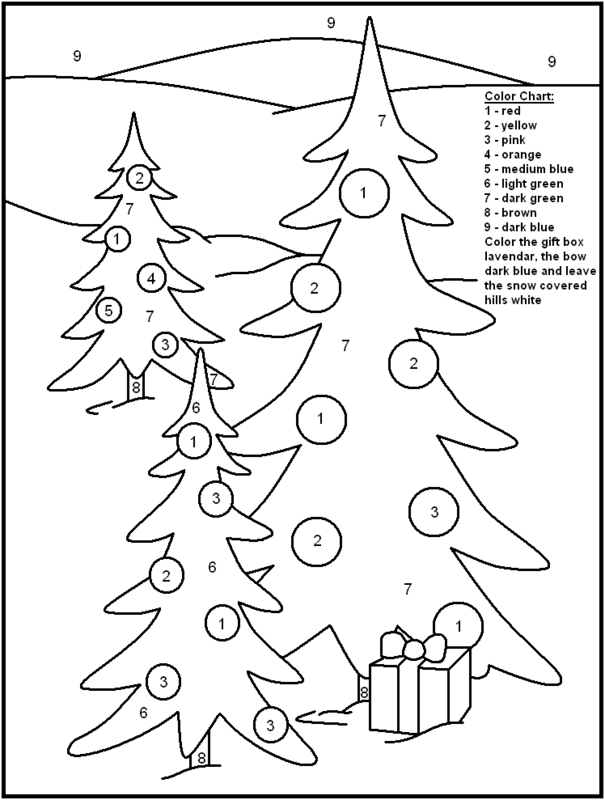 First, solve the problems and then color accordingly to see the magic of this special Christmas tree. Christmas tree decorations are not just limited to individual houses. You might have seen bigger and grander Christmas trees in your local malls or even at the city centers. Look at this colossal tree with its giant gift. It even dwarfs the locomotive passing by. Follow the numbered instructions to add colorful splendor on this page. 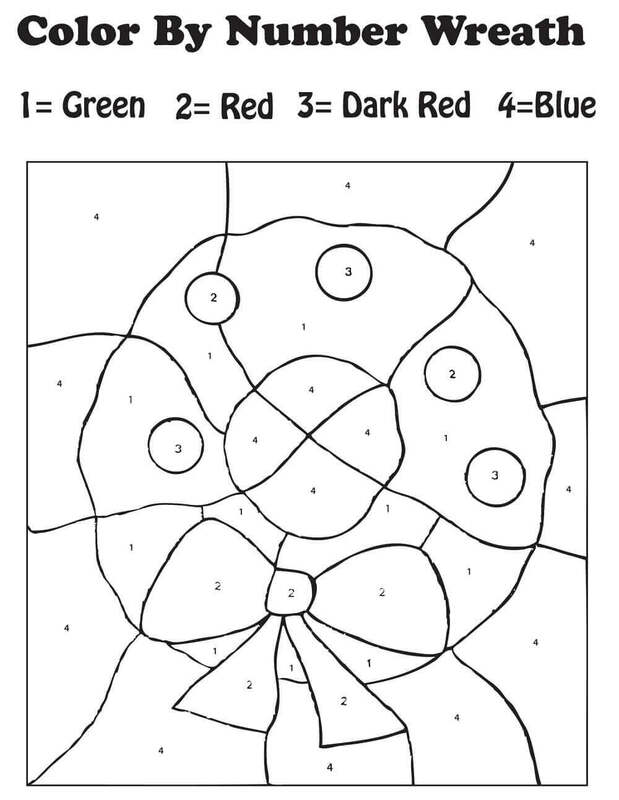 Don’t miss out the coloring instructions for the unnumbered areas to bring out the complete picture. Have you ever seen such an adorable cupcake before? Instead of eating it, you will find yourself wanting to keep it. From the Christmas hat with Christmas berries to the bowtie and suspenders, this cute cupcake illustration is simply irresistible. 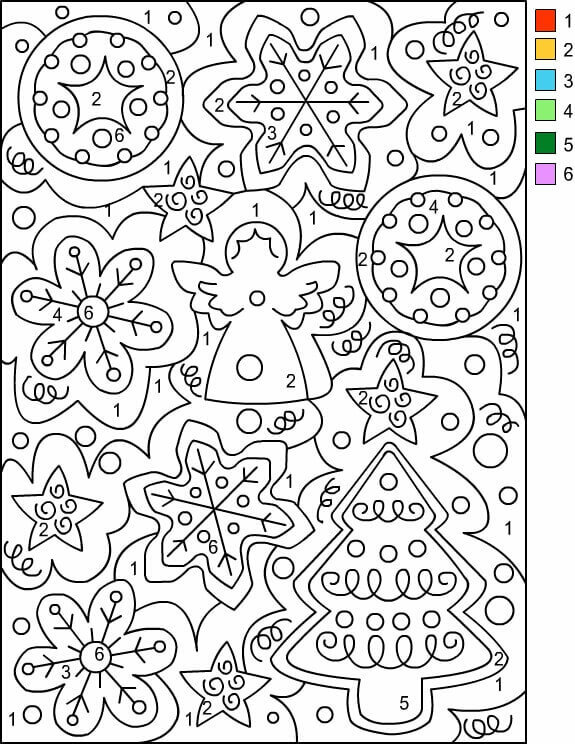 Let the colors shine through by printing and properly coloring this page. Maybe like in the fairy tales the Christmas ornaments talk to each other when everyone in the house has fallen asleep. Maybe ornaments like this bird sing a Christmas carol and the lost reindeer find its way home listening to the song. Capture this enchanting scene in color by printing and following the colored instructions on this page. No matter how much work the elves have, they never forget to leave gifts for Santa who is busy delivering presents around the world. This year, they have made a giant boot and filled it with gifts for him. 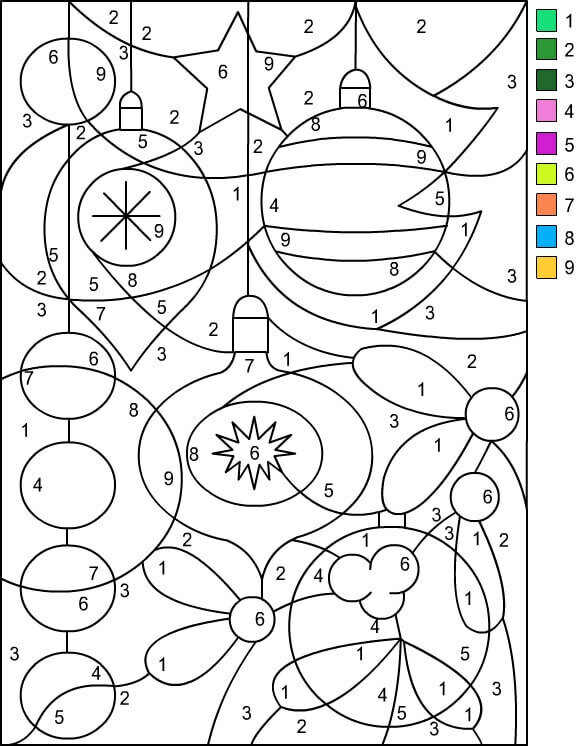 Discover the gifts by coloring each numbered segment according to its corresponding colors. 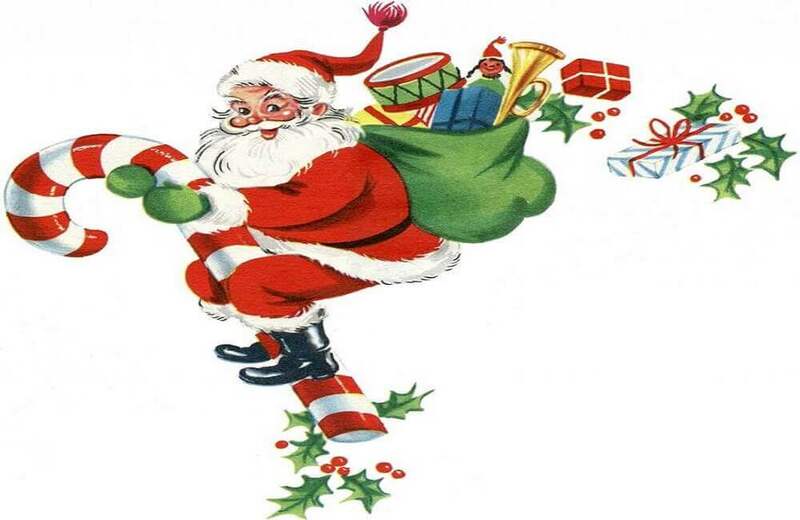 Talking of the elves and gift for Santa, here is our Father Christmas himself, all dressed up for Christmas Eve. He is looking a little confused. That’s because he is not in his usual color. Print this page and read the color chart carefully to bring out the colorful avatar of our Saint Nicholas. After getting ready, Santa Claus is already delivering his gifts to the first house. Here he is taking a moment to admire the beautiful decorations on the Christmas tree before leaving the gifts for the house owners. As Santa flies away on his sled to get to another house, this snowman is feeling happy to have seen Santa. You can even see him waving goodbye with this stick fingers. Add to his joy by adding colors on this page. Like the snowman, it is also time for us say our goodbyes for today. We hope we were able to get you into the joyful holiday spirit with this collection of Christmas color by number printables. Don’t forget to spread happiness and good cheer everywhere you go, this holiday season and always.